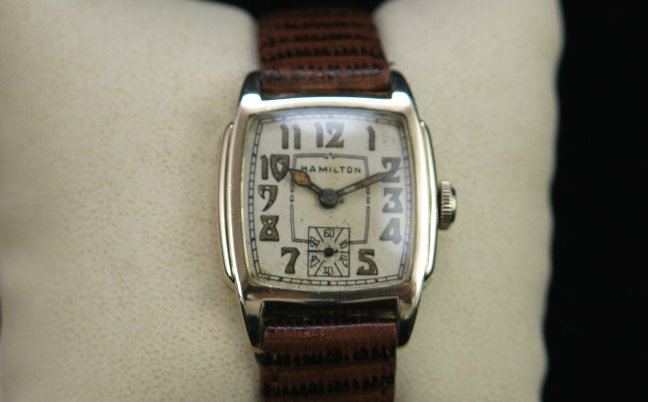 The 1933 Hamilton Scott is the first of three different models that Hamilton produced with the name "Scott". The other two were made in the 1950's and 1960's. The original Scott was produced from 1933 through 1937. The Scott came in a 10K gold filled case, either in yellow or white. Like other period designs, the Scott typically shows wear to the top of the lugs and along the bezel near the crystal. The edges of the case back will often exhibit deep wear. The trick to getting a nice Scott is to get one with a nice case. The rest can be easily restored. Three different dial choices where available... an AGN dial, luminous or black enamel dial. 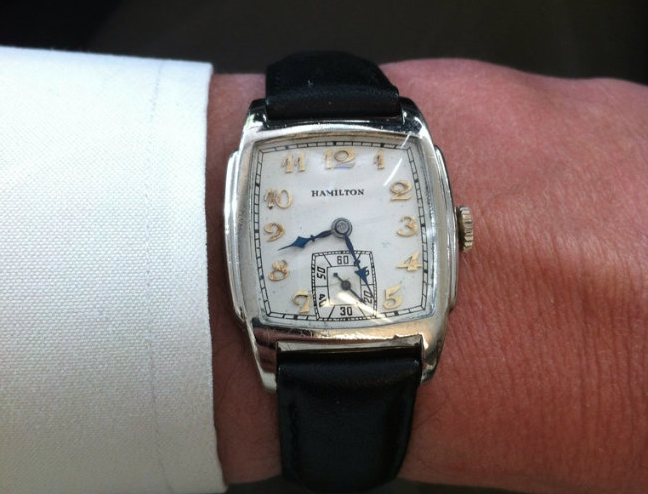 Under the dial is a 17 jewel, 6/0 sized 987F or E movement, depending upon how early a model it is. I purchased a Scott a while ago and I thought for sure it was yellow gold filled based on the seller's photo. The hands had me a little puzzled though. Once I got the watch, I was still thinking it was yellow gold until I started to clean it up. The yellow must have been years and years of nicotine build up or something, as once I started to clean it up, the case became white! 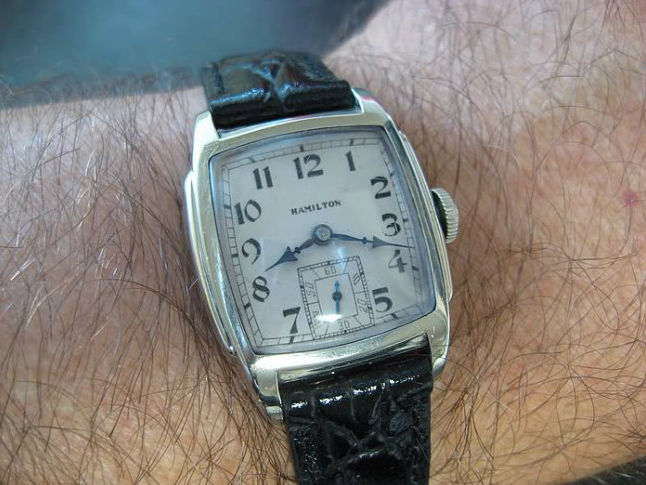 One bit of Hamilton trivia is back in 1920's and 1930's, white models with AGN dials shared the same dial with yellow models. So the numerals were solid yellow gold. To differentiate yellow models from white, the white models got black hands. 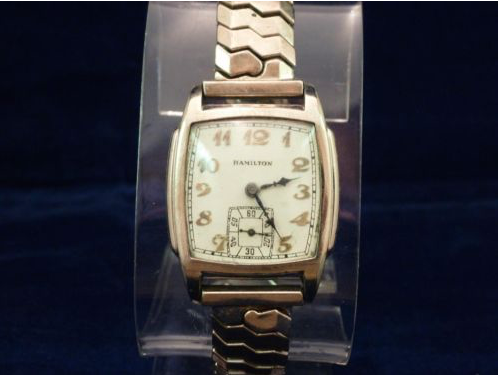 So if you see a loose movement for sale with black hands and yellow numerals - it most likely came from a white gold case. Here's a nice example of a luminous version of the yellow Scott. I don't know what font style the numerals are but I think this is one of the coolest dial patterns Hamilton used. And here's a wrist shot of a very nice white Scott with the black enamel dial - courtesy of fellow Hamilton enthusiast, Tom Diss.